The 10 Best Places for Pancakes in New Mexico! Hotcakes, flapjacks, griddle cakes. Whatever you call them, pancakes are one of those quintessential breakfast meals that are a perfect canvas for a simple dollop of butter or smothered in fresh fruit and whipped cream. They come stacked, folded or rolled to hold a filling and in a variety of fun shapes and sizes. Here are the 10 best places for pancakes in New Mexico. This 1960s retro building may be a blast from the past, but the food isn’t. It’s classic diner fare served for breakfast, lunch and dinner. If you’re starting your day there, pancakes are the meal to order. They’re fluffy inside with crispy edges and a sweet taste. The secret…malt powder. Famous for its use in malted milkshakes and Whoppers, it adds a sweet and nutty undertone to this traditional morning meal. You’ll win the food trifecta here—Mexican food, steakhouse, and a pancake palace. What a combination! Opens at 6 a.m. with a full breakfast menu that includes a traditional short stack order of flapjacks, plus unique pistachio, blueberry, cinnamon and apple strawberry, as well as pigs in a blankets—a sausage and pancake combo. Great place for families. The name of this cafe translates in the Aztec language to owl. You’ll see a lot of them in this family owned eatery, gifted to the owners from customers throughout the last 30 years. There are a variety of pancake choices—short and full stacks served with whipped butter and syrup, plus the option to add blueberries, fur-berry sauce, nuts or 100 percent maple syrup. Melba pancakes come with a peach and raspberry sauce. Tollhouse are smothered in chocolate chips and walnuts. Don’t miss the atole pinon, a Southwest specialty. Pancakes make every morning better. Here, there’s a mouthwatering selection. Banana Bliss with walnuts and caramel. Lemon curd is the star in the lemon-raspberry stack. Simple blueberry flapjacks are dusted with powdered sugar. The Sunday morning hotcakes are simply dressed with a dollop of butter and drizzle of maple syrup. If you’re still hungry after this morning meal, grab a homemade cinnamon roll for later in the day. A cup of locally-roasted coffee, made on-site, is the perfect complement to the signature Mesilla hot cakes served here. Two large made-from-scratch pancakes are served with a strawberry and blueberry coulis, as well as real maple syrup. For a smaller version of this melt-in-your-mouth delight, get them in silver dollar size. Dog friendly patio for those for those out for a meal with a canine friend. For close to a century, this family-owned restaurant has been a landmark in town. What began as a shop that focused on candy and ice cream, morphed throughout the years into a restaurant known for breakfast and lunch specialties, and pancakes top the list. From the old-fashioned hot cakes dripping with butter and syrup to the pancake sandwich that comes with bacon or sausage in the middle and an egg on top, these favorites are a kick-start to any morning. Children will be delighted with the Mickey Mouse shaped pancake. If you order a pancake, be prepared to not clean your plate. These cakes are massive—the size of a small tire—but they’re delicious. Recipes at this small, locally-owned eatery are family favorites, passed down for generations. 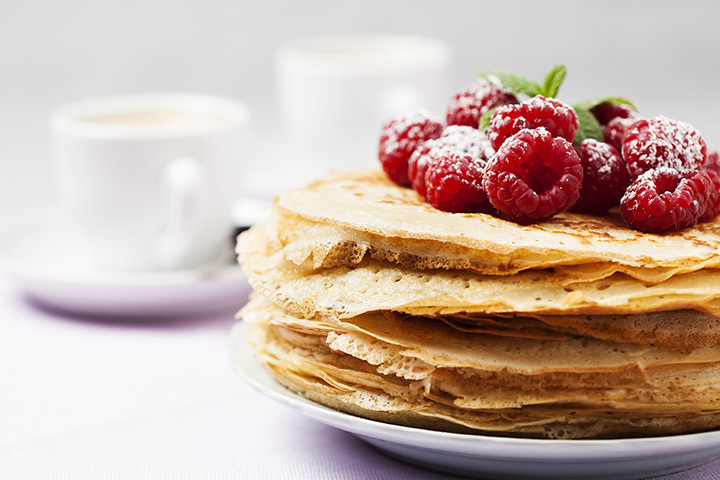 Pancakes come in a full, short or single stack. You can order them plain or with added blueberries, chocolate chips or pecans. A charming restaurant that makes you feel right at home. The phrase, flat as a pancake, describes this massive breakfast treat that’s the size of a dinner plate. A town favorite, the cafe is known for its hearty portions and the hot cakes are no exception. They’re light, fluffy and sweet, but add blueberries or pineapple or strawberries and it kicks the whole experience up a notch. Before heading out to the rugged terrain of the Four Corners area, stop for a filling meal at this family-owned restaurant. They’re served hot from the griddle with real butter that melts into all of the nooks and crannies of these tasty flapjacks. Add some syrup or jam and the meal is complete. Strawberries and fresh cream make this a breakfast dessert. An old prospector and his mule embellishes the outside of this family-owned restaurant, a harbinger of the good ol’ comfort food that’s served here. The pancakes come in either a stack of two or three. The special comes with three pancakes, two eggs and bacon, sausage or ham. Choose from a selection of five different syrups.